The Church of England has taken a bold step away from a 2,000 year tradition - interpreting the Bible as teaching that only men can serve as bishops. A majority of the Church's ruling body, meeting in York, has decided that it is theologically justified to ordain women as bishops. But the real challenge will be maintaining that majority as the General Synod seeks a way of introducing them. When the Church of England decided in principle a year ago to ordain women as bishops, it was following a path pioneered by liberal Anglican Churches in New Zealand and Canada. Fourteen of the 38 autonomous Anglican churches around the world - including the Scottish Episcopal Church - have cleared the way for women bishops, and the Episcopal Church of the United States last month elected a woman as the first Presiding Bishop. But it is a far-reaching step, and the Church of England, the mother church of the Communion, took it, albeit provisionally, without a sufficiently careful look at whether the Bible allowed it. 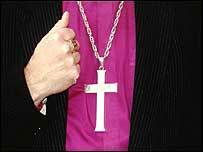 In fact traditionalist opponents of women bishops have relied mostly on a biblical argument. They say that because Jesus chose only men to be his apostles, only men should take its key leadership role now. That argument came under direct challenge at the Synod. Leading biblical scholars such as the Bishop of Durham Tom Wright said there was plenty of evidence that women did help lead the early Church. Dr Wright said the fact that the first person before whom Jesus appeared after his resurrection was a woman - Mary Magdalene - was particularly significant. It made her the first to relay news of the resurrection, the central message of Christianity. Dr Wright told the Synod: "Yes Jesus chose only male apostles, and that's important as it goes, but Jesus launched in the resurrection a new project, new creation and right from start women were involved in it." 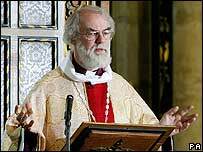 The Archbishop of Canterbury Rowan Williams reminded the Synod that bishops had a special leadership role in the Church, and that just because it had women priests, it did not mean that women bishops were legitimate. Dr Williams said: "There is a theology that takes for granted that bishop is the animator of mission, that is the ordaining and sending of persons. And therefore, from that perspective, the ordination of women bishops becomes a slightly different matter from women priests." But when the vote came it was comfortably in favour of taking the historic step. Comfortably, but not overwhelmingly. Bishops, clergy and lay people vote separately on such important matters, and the majority among the laity was less than the two-thirds that will be needed to take the final decisive step to ordain women bishops. And that could turn out to be a problem. Liberals - especially groups representing women clergy - were elated by the clear majorities they achieved at the weekend. But there is still a need to find a way of treating fairly the traditionalists who believe women cannot rightly be bishops and therefore refuse to serve under them. There are plenty of moderate conservatives in the Synod - not least among the laity - who were prepared to vote for the principle of women bishops, but whose support could evaporate if they don't like the compromise on offer. Already during the past 12 months, plans to provide traditionalist parishes with alternative, male bishops, have run into trouble. Some traditionalist clergy still talk about leaving the Church if no way is found to prevent their coming under the jurisdiction of bishops whose authority they could not recognise. The Bishop of Chester, Peter Forster, said the whole process had been going round in circles. "The reason I believe is that we've been attempting the impossible" said Bishop Forster, "to devise a way to have women bishops which doesn't either un-church a much-valued section from within our midst, or simply produce an incoherent doctrine of the church." Bishop Forster said the historic step was being approached too hastily, and the Church risked prejudicing a debate that was only just beginning. He said patience on such issues was sorely needed in the Church. More than a decade after women were first ordained as priests, for supporters of women bishops, the call for patience sounds too much like an excuse for delay.